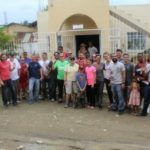 When I signed up for Fathom Travel’s new “Social/Impact” cruise to the Dominican Republic, I was skeptical about this new concept for travel. Can 500 or so “cruise ship-pampered” Americans really make an impact? Were we going to be faced with cynicism from the people of the Dominican Republic? How would we be seen through their eyes? As 25 of us boarded our assigned bus, we were chatting about the cruise, as well as the beautiful scenery as we drove through the beautiful, lush countryside. Suddenly, we turned down a small dirt road, and there was trash everywhere. We had arrived in the neighborhood where we were going to work. We pulled up to a house, and the family came out to greet us. We were there to lay a concrete floor for them in their house. They showed us through the house, where they had been sleeping on a dirt floor (mud, when it rained). They pointed out some holes in the dirt that were made by vermin who wanted to share their home. Dirt floors result in an unsanitary and unhealthy environment, resulting in life-threatening respiratory and parasitic diseases. I suddenly realized we were about to make a difference in this family’s life. 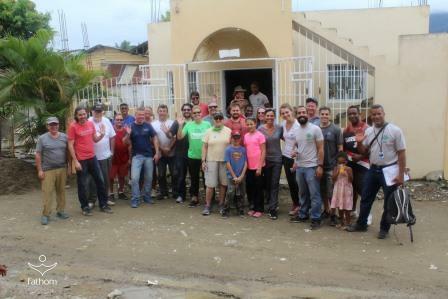 Although I had arrived wondering if I was in good enough physical shape to help with this project, I immediately became a part of the bucket brigade…swinging buckets filled with concrete down the line and into the house, where their home was being quickly transformed. During a break, their little boy climbed into an empty wheelbarrow. Remembering how my dad used to push me around in one, I started pushing the little boy around to the sounds of his giggling. Back to work, and several hours later we were done…the family now had a concrete floor in their home. The father gave a speech, and thanked God for sending us to help his family to have a better life. Then as we left, the little boy came up to me and gave me a big hug. I was no longer skeptical…but was grateful that I had been able to make an Impact. Fathom expects to provide concrete floors to everyone in that neighborhood by the end of the year, before moving on to another area of the island. Other projects they are undertaking are replanting of trees in the rain forest; helping a chocolate factory, as well as a paper recycling company, increase their production to grow their business, helping to create more jobs; making water filters to provide clean drinking water; and helping students as well as adults with their English.